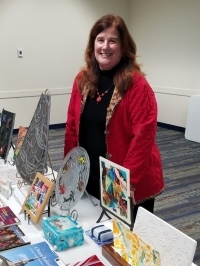 On Tuesday, Nov. 6, the Westlake-Westshore Arts Council presented stained glass artist Ms. Judy Kean, owner of Creative Space Avon and The Glass Studio. Ms. Kean did a wonderful presentation about stained glass artists, the different kinds of stained glass and various locations in Cleveland which have stained glass, including Tiffany stained glass. She gave a very thorough explanation about different methods like copper foil and lead. In addition to the presentation at Porter Library, Ms. Kean displayed various kinds of stained glass artwork as well as books on the subject. She showed a short segment of "Let There be Light," a film which highlights the work of Rowan LeCompte and Dieter Goldkuhle who both made their last stained glass window in Washington National Cathedral. Both men are interviewed describing the work and captivating beauty of their creation with the light shining through the large rose window. This was an excellent aspect of Ms. Kean’s talk, offering a personal glimpse of the creative process and end result. Ms. Kean has been working with glass since 1984. She has taught at the Rhein Art Center in Lakeside during the summer for more than 12 years. She teaches beginning to advanced stained glass and fused glass classes at Creative Space Avon, as well as doing repairs, restorations and new stained glass commissions. Projects include religious, residential, business and public art. Ms. Kean is considering a black and white juried show for the next gallery show in late January 2019. Ms. Kean discussed the recent exhibit at Creative Space Avon which included artwork created by veterans. A portion of the proceeds benefits the Valor Home in Lorain which provides transitional housing for homeless male veterans. She created a unique way to support those who served our country by displaying the talent of an artistic group of veterans while also generously donating a portion of the sales to a home for veterans. It is clear her creativity is not limited to glass. The Westlake-Westshore Arts Council meets on the first Monday of the month at 7 p.m. at Westlake Porter Public Library. For more information on membership and programs, visit w-wac.org or call 440-250-5565.